A ship is safe in harbor, but that is not what ships are for. I must not fear. Fear is the mindkiller. Fear is the little death that brings total obliteration. I will face my fear. I will permit it to pass over me and through me. And when it has gone past I will turn the inner eye to see its path. Where the fear has gone there will be nothing… Only I will remain. Some weakness can be cast out by denying its existence, but most weakness must be acknowledged and analyzed to benefit from the application of logic and positivity. Acknowledged but not accepted. So when those moments of weakness come—and they will—I am prepared to look at them, not away. I have no fear, for fear is the little death that kills me over and over. Without fear, I die but once. People don’t fail. They just stop trying. I’ve failed over and over in my life, and that is why I succeed. You don’t become great by trying to become great. You become great by wanting to do something, and then doing it so hard that you become great in the process. Your inner critic is just the manifestation of your fear. The way to move forward is to let the monsters be seen and the scary voices be heard. Sometimes, people who are invited to express themselves freely will react with feelings of paralysis, fear, and intimidation. … The cocoon is spun partly from fears of self-disclosure. … If we allowed our simple essence or ungroomed emotions to show, we might look foolish, vulnerable, or unattractive. Some people are unable to surrender to aimlessness because they fear losing themselves and don’t realize that the structure of the art material or the limits of the physical space will always act as container for our expressions. Painted 50 paintings: Expected: 24; Actual: 0, because I can’t get out of my own way. Ran a cumulative 1000 miles: Expected: 500; Actual: 107 miles, although I’m 400 miles behind I’ve still got time to make it up. Written 50 blog posts: Expected: 24; Actual: 21. Posted 12 videos on YouTube: Expected: 6; Actual: 0, but there will be video soon. Created a portfolio of 12 graphic design works: I have 2 designs, and more to be completed. Will post them soon. Practiced the trumpet for 50 hours: Expected: 0; Actual: 0. Run a 5k race in under 24 minutes: Expected: By end of Q3; Actual: ? Run a marathon in under 5 hours: Expected: November; Actual: ? Lifted 1000# in the big 3 lifts: Expected: not yet; Actual: I’ve started lifting again. Settled my remaining SF/F/H debts: I’ve written an apology letter. Launch a new SF/F/H online magazine with an associated podcast: still trying to sync up with potential host; launch in Q3. Edit and publish one anthology/collection: in the queue. Create and publish a mobile app: v1 requirements are being worked on. Write and submit a technical article: no, but I know what I’m writing. Write a fiction story: no. Write one non-fiction book: no. Write a novel: no. I think I’ll schedule this for NanoWriMo in November. I’ve pulled myself away from my intended path in Art History. I felt a great need to attend to tackling the creative theory books on my list. I’ve skipped ahead a bit in Art History and read a few books on M.C. Escher. I guess I’m having some nostalgia for college. 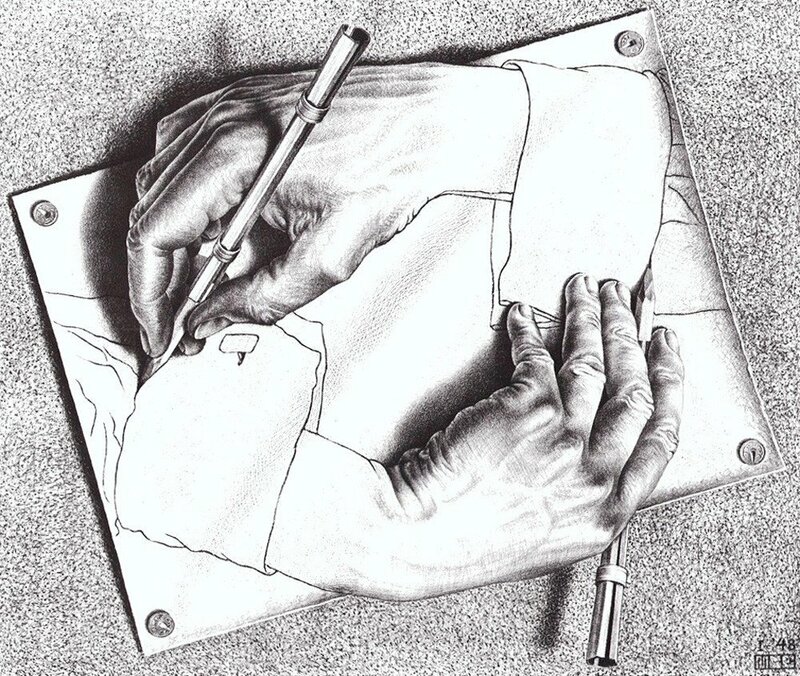 I absolutely love Escher. I’m still working on Vasari’s The Lives of the Artists. Taking it slowly. I’ve created a page called A Very Artistic Library to list out the most useful art books I’ve found so far. Tackled some integration between Facebook and some of my existing sites. There’s a Space Western Magazine page that I’m experimenting with. Other pages for other sites to follow. I’ve launched a journal to explain my attempts at raising money to help fund my daughter’s college education at How Am I Going To Pay For This? I’ve been teaching my daughter web design, and she’s been doing light HTML work to earn money for school. By the end of the summer I expect her to be doing CSS and design. At work I’ve had to up my development skills. I’ve read a plethora of Web Performance books and watched over 100 hours of Web Development classes. I have even more classes to watch next quarter. Have a small list of technology projects to accomplish. This, in theory, is the easy part. It’s especially easy for children. Older, less naive, people find that they make excuses when they should be drawing. Whole careers have been wasted simply through the inability of someone to start something. Pure procrastination. Fear of failure. Waiting for the right time, the right mood, the right milestone. Just start drawing. When an artist says “I’ve been drawing since I can remember” what they really mean is, “I never stopped drawing.” They didn’t stop drawing when their mother stopped putting their drawings on the refrigerator. They didn’t stop drawing when they didn’t win a prize in their school’s student art contest. They didn’t stop drawing when they got a real job. Don’t stop drawing. I promise you that if you do those two things that you will get better at drawing. You will be better every day. In ten years you will be better than you are today. It doesn’t have to be hard work, but you do have to work it. This is the advice I want to give to everyone about everything. There are no shortcuts. The people who you think are inherently talented: just started and never stopped. Over the past two years I’ve been working through a series of books on Art, from histories to theory to manuals. I’ve decided to share some of the best works that I’ve come across. This page, A Very Artistic Library, will be an up-to-date list of recommendations for people who want to learn more about how to create art. A 12-week program to get your mind together as it relates to creativity. I’ve worked through it twice last year. I’ll be picking it up and working through it again and again. Time and again I’ve heard people talk about flow. This was the book that started the discussion of the experience. I heard Amber Rae on the Your Creative Push podcast. She discussed what she called her Multiple Personality Order. I realized that I needed to read this book. I didn’t want to read it. The first chapter was a struggle for me. I had to drag myself through the book, because it was so relevant. I originally read Sakyong Mipham’s Running with the Mind of Meditation book last year. I purchased this one without realizing that it was by the same author. I purchased this book first. It was one of the blurbs on the back that sold me: “…the idea that we all have ‘multiple minds’ operating as a ‘confederation’…” It was too relevant to pass up. If you’re ever feeling that you’re not good enough, remember that no artist thinks that they’re good enough. Here’s a quote from M.C. Escher, one of the finest draftsman you could encounter. — From a letter by MC Escher to his son November 12, 1955. Over the past two years I’ve been working through a series of books on Art, from histories to theory to manuals. I’ve decided to share some of the best works that I’ve come across. I’ll be adding all of these, and future works, to my Very Artistic Library page. It will be an up-to-date list of recommendations for people who want to learn more about how to create art. Learning to paint — how to make a compostion, sketches, different painting techniques, tools, supports, etc. These four works give a comprehensive review of painting, from painting what you see, to painting what’s impossible to see, to explaining what it is that you actually see. These are the books that you should pour over, read repeatedly, and constantly review year after year. Richard Schmid breaks down the components of the craft, techniques, and process of painting. It’s no longer in print, but if you can find it, it’s an excellent resource. Imaginative Realism isn’t about painting aliens and dinosaurs and dragons. OK, it isn’t just about painting aliens and spaceships and dragons. It’s also about painting real things that you’re unlikely to see: ancient civilizations, historical personages, and extinct animals. And to top it off James Gurney reviews what you’d need to consider in the process of getting work done — everything that I learned in Commercial Art — thumbnails, color studies, drawing from photographs, and more. Patrick Jones gives us another comprehensive look that serves as a complement to Imaginative Realism. While James Gurney explored the traditional process, Patrick Jones gives more detail for working from photos and using digital painting. Color and Light is well worth the price if all you take away from this book is the understanding of the following gem: “Under normal lighting conditions, the rods and cones cooperate to give you an interpretation of reality.” but the book contains so much more and many more gems just like it. My daughter is earning her college degree. Which is a peculiar phrase because really she’s paying for the degree. Which is another peculiar phrase because most young adults fresh out of high school don’t have $80,000 or more to pay for a four-year degree. So I guess the actual phrase is more like she’s promising to pay for the degree. In the meantime that leaves us with a question. I’ve started a journal in which I hope to answer this ultimate question: How am I going to pay for this? Posted in Ramblings | Comments Off on How am I going to pay for this? Over the past two years I’ve been working through a series of books on Art, from histories to theory to manuals. I’ve decided to share some of the best works that I’ve come across. I’ll be adding all of these, and future works, to my Very Artistic Library page. It will be an up-to-date list of recommendations for people who want to learn more about how to create art. I’m kicking off the series with Drawing. Drawing is the first skill that you need to learn as an artist. Initial sketches are used in every other art: painting, stained-glass, jewelry, sculpture, and more. Drawing on the Right Side of the Brain: The Definitive, 4th Edition by Betty Edwards will teach you how to learn to draw what you see. If you can’t make art in simple black lines then it makes it so much harder when you try to add value, shape, and color. Drawing Atelier by Jon deMartin will teach you what you should’ve been taught in art school: the process that classical and master artists used to create their drawings and a good foundation for creating thumbnails and sketches that will eventually become other works of art. These two books together will help you create the drawing for your painting; what the Renaissance artists would have called the composition or cartoon. I don’t think I’m getting my thoughts out properly. It feels like there’s a gap between what I want to say (portray, write, etc.) and what I actually say. I’m clumsily groping for the words to express what I’m trying to say. The solution: allow yourself to do things badly. It’s not that I’m setting out to make anything that’s bad, but that I’m making things and allowing them to be bad. The only way to get better is to allow yourself the opportunity to do bad work. I forgot that I was doing this (this blog; this artwork; etc.) for myself. Everything doesn’t have to be perfectly crafted for display to others. Sometimes it’s more important to get the ideas out as they happen. That’s the reason why I promised myself to do 50 posts in a year. Some of it will be rushed, premature, poorly thought out, but the main goal is to just get it out. This isn’t a place to withhold. The hardest obstacle to get over is for an artist is to not be very good; to know they’re not very good; and yet still need to do art, to know that they need to do art to get better, and to know that they won’t get better without doing the art that they know will be bad.